Folger First Folio number 54 traveled over 10,000 miles from Washington D.C., to San Diego California and Honolulu, Hawaii, during our First Folio! The Book That Gave Us Shakespeare tour, and is on view in our Great Hall through January 22, 2017. But its journey was already in progress long before this traveling exhibit. It had been moved from the Hutchinson family library, at the estate in Owthorpe, in Nottinghamshire, England, where it was since at least the late seventeenth century, to a “very large, apparently foreign made, Chest” by the time Captain Charles Hutchinson inherited it in the nineteenth century, after the estate had been sold out of the family. While Captain Hutchinson placed a high sentimental value on the book, and attached a family history to it, nobody in the family had established the market value of the item. That would change when Captain Hutchinson’s son, the Rev. F. E. Hutchinson, sold it at auction in 1913. At that time, the price attached to the volume’s association with Colonel John and Lucy Hutchinson was tested. For that matter, the question of establishing clear evidence of ownership by the Colonel and Lucy Hutchinson also was only seriously raised when the association that the family took for granted was subject to scrutiny by others. In the history of this copy, we can see the many different ways readers and owners have valued the book over time. This volume was listed as the single item of “The Property of a Gentleman” in a Christie’s catalog. According to correspondence in Folger archives, Henry Folger grumbled to his agent, A. H. Mayhew, that Mayhew’s suggested bid of £800 was a “high price considering many defects” (cable from Folger to Myhew, July 17, 1913). But Christie’s had rebuffed Folger’s pre-auction bid of £500. 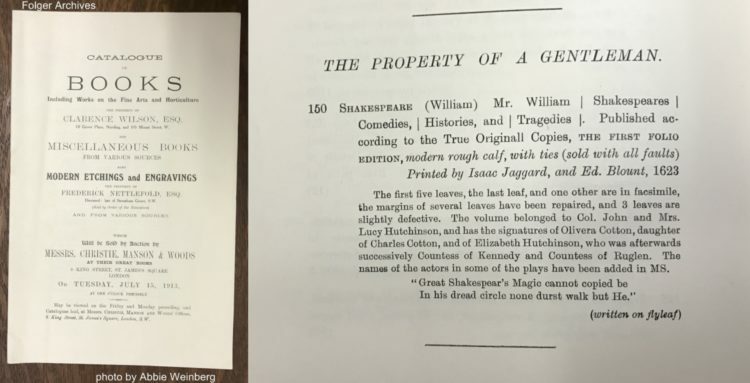 Mayhew purchased it for £750 cash on Folger’s behalf in the days after the auction (letter Mayhew to Folger, July 23, 1913).1 This was the forty-sixth copy of the First Folio that Folger bought. The Christie’s sale catalog from the July 15, 1913 auction, and the entry listing the Hutchinson folio. Arguably this copy is no more defective than most of the First Folios in the Folgers’ collection. Indeed, most surviving copies of the First Folio are “sophisticated” copies that include substitute pages from other copies or later facsimiles. In some cases, missing printed text is replaced by handwritten copy.2 Folio number 54 is “defective” in that it lacks the original title page, most of the preliminary pages, and has several other damaged leaves. Christie’s auction catalog did not name the owner of the First Folio for sale. Correspondence between Folger and Mayhew indicates that they were trying to figure out that identity and that they were initially confused about which copy of the First Folio, still in private hands, was being put up at auction.3 They came to understand that it was copy 79 in Sidney Lee’s 1902 census of known copies of the First Folio. Lee had described this copy as in the possession of The Rev. F. E. Hutchinson, Tisbury Vicarage, Salisbury.4 Lee’s provenance begins with “apparently in the possession c 1650 of the Hutchinson family of Owethorpe, Northamptonshire, of which Col. John Hutchinson, the parliamentarian, was a member.” Lee noted autographs in the book of several members of the family, including Col. Hutchinson’s step-nieces, first cousins Olivera Cotton and Elizabeth Hutchinson, circa 1680. The scholar’s cautious “apparently” in reference to a date certain is worth noting. The Hutchinson family believed that the association with Col. John and Lucy Hutchinson added value to the copy. They played prominent roles in English history: he a regicide, she a writer, both of them staunch puritans and parliamentarians. In fact, the Rev. Hutchinson considered the association with those forebearers so important to value of the book that he made an unusual move after the sale. The Rev. Hutchinson wrote to Mayhew with an offer of a single leaf from one of Lucy Hutchinson’s manuscripts for £100. As Capt. Charles Hutchinson had revealed in his family history, those manuscripts had been preserved in the same “very large chest” that housed the Folio. The Rev. 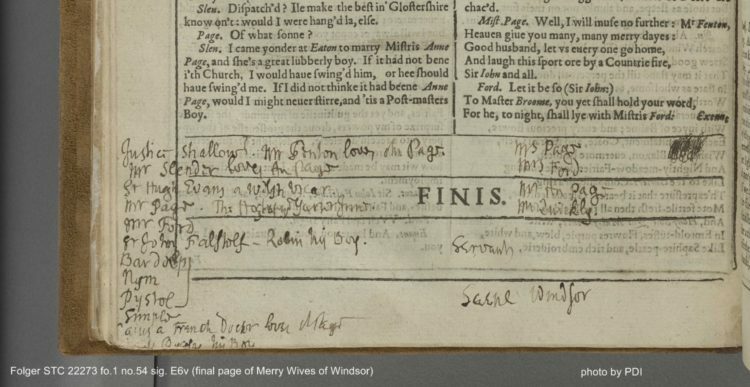 Hutchinson reasoned that a manuscript page would establish that at least some of the annotations in the First Folio were in Lucy Hutchinson’s handwriting. Was Hutchinson angling to interest the buyer in Lucy’s manuscripts now? Or did he just want to be sure that the identification with the Colonel and Lucy Hutchinson, so important to the family, was preserved? Mayhew didn’t think a single leaf of Lucy Hutchinson’s handwriting was worth £100. But he understood that the handwriting could resolve the question if the manuscript notes in the Folio, including some lists of dramatis personae, were in Lucy Hutchinson’s hand. He wrote to Folger that he was “a little inclined” to think they were (letter Mayhew to Folger, July 29, 1913). Folger did not take Hutchinson up on the offer. But neither did he nor Mrs. Folger question the association. The catalog cards that Mrs. Folger kept identify this copy of the First Folio as the “Hutchinson copy. 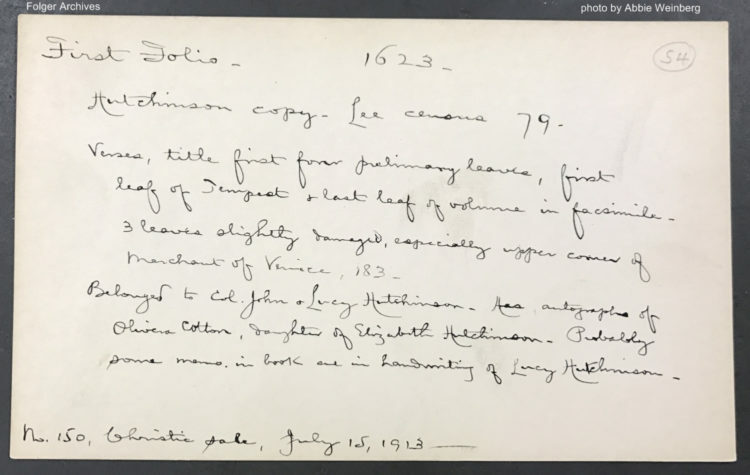 Lee census 79.” The card noted that it “belonged to Col. John & Lucy Hutchinson” and that some manuscript notes were “probably” by Lucy Hutchinson. But this was an indifferent part of the history the Folgers were after—the creation of a memorial in stone to Shakespeare. As dedicated as they were to establishing their memorial in the democratic nation’s capitol, they did not see adherence to a seventeenth-century anti-monarchical cause as a cornerstone of their mission. Original Folger catalog card for First Folio number 54. The Folgers overlooked many opportunities to broaden the scope of their collection beyond their single-minded pursuit of Shakespeare’s texts. This incident may have been the only such opportunity with the potential to enrich scholars’ understanding of women’s place in literary history. Might acceptance of that offer of a page from Lucy Hutchinson’s manuscripts have led to other offers of her manuscripts? Neither of the parties in these transactions contemplated the possibility that they had at hand a discovery to forestall Virginia Woolf’s fruitless search for ‘Shakespeare’s Sister’ at the end of the following decade. Woolf insisted on the need for material things to support a life of writing. While she had in mind £500 a year and A Room of One’s Own, scholars today understand that material support for a life of writing also includes the collecting, editing, and publishing of texts. The Folgers collected multiple copies of the First Folio in order to lay the foundations for authoritative texts of Shakespeare’s work. Indeed, Folio number 54 has added value to that enterprise. Charlton Hinman demonstrated that each copy is a witness to some stage of the textual production. Or rather, some mixed stages of textual production. For instance, in Folio number 54, Hinman found that the last page of As You Like It was a press variant, representing its most fully corrected state. 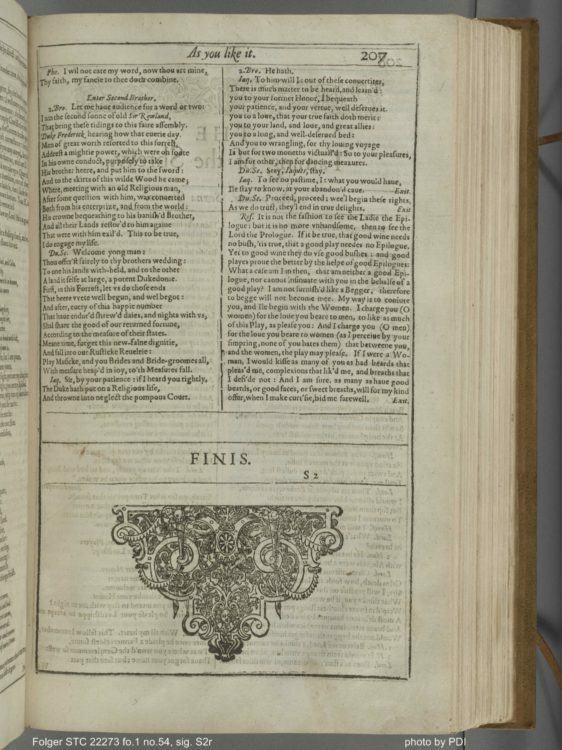 That page is one of five from Folio number 54 that Hinman included in the idealized facsimile First Folio of Shakespeare he created with pages from twenty-nine copies (and one fragment). Only now, a century after the Folgers bought the “Hutchinson copy,” is Lucy Hutchinson receiving her full due as an author. Four volumes of the Works of Lucy Hutchinson are underway at Oxford University Press, under General Editor, David Norbrook. Only now are her translations from the Latin of Lucretius’ De Rerum Natura (undertaken a decade before the first printed edition in English) and Order and Disorder, a verse rendering of the first chapters of Genesis, receiving full critical editions. Only now are her surviving manuscripts being surveyed. We do not know what page from the manuscripts the Rev. Hutchinson thought of selling to the Folgers. 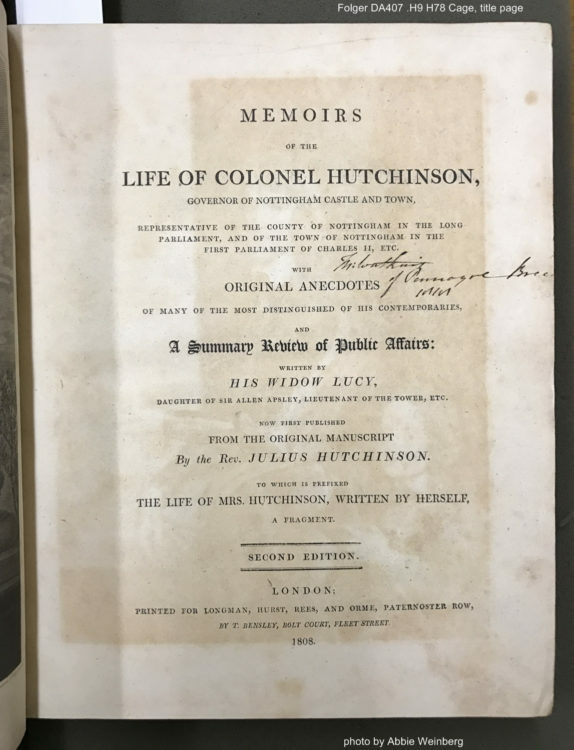 In the first printed edition of Lucy Hutchinson’s Memoirs of the Life of Colonel Hutchinson (1806), the facsimile of her handwriting was taken from notes on a sermon, in a manuscript now lost.5 Whatever agreement the two parties in the Christie’s sale reached about the monetary value of the Hutchinson family First Folio, neither party explored the literary value of Lucy Hutchinson’s writings. But there is in the Folger collection still one trace of that correspondence between Mayhew and Henry Folger about Lucy Hutchinson’s writing: a penciled storage box number in Mrs. Folger’s hand confirms that the second edition of Lucy Hutchinson’s Memoirs (1808) is the copy Mayhew purchased for Henry Folger in 1913. Anthony West’s The Shakespeare First Folio: The History of the Book, Vol. 1 (Oxford, 2001) uses Book-Auction Records as the source for the price Folger paid (in Table I.BB, p.111). See Caroline Duroselle-Melish’s previous blog post on sophisticating the First Folios for more details. Indeed this purchase inspired them to solicit copies from other private owners they could identify. See Andrea Mays, The Millionaire and the Bard (Simon & Schuster, 2015), 184-7. This was not the editor of George Herbert’s poetry, incidentally, but his father. To keep it all in the family, this edition was prepared by the Rev. Julius Hutchinson, father of Capt. Hutchinson. Kathleen Lynch is Executive Director of the Folger Institute, a position that puts her in charge of organizing formal programs for scholars at the Folger Shakespeare Library. With her Folger colleague, Betsy Walsh, she curated the Folger's summer 2012 exhibition, "Open City: London, 1500-1700." Her book, Protestant Autobiography in the Seventeenth-Century Anglophone World, is now available from Oxford University Press. Plenteous thanks to Kathleen Lynch for this important information. (I had read about this find earlier, perhaps a Fine Books & Collections Blog post, but not in such detail.) All of this recent activity holds special interest for me, as my copy of Lucy Hutchinson’s “Memoirs” (1st ed., 1806; complete; 446 pp; original boards; armorial plate of James Frampton) is very likely to now appreciate in market value. I’ll be watching for further follow up. (And I shall contact David Norbrook, alerting him to my copy & its provenance). My copy of the Hutchinson appears in an article on my rare books, Fine Books & Collections magazine, Fall, 2016. Thank you, again, Kathleen Lynch ~ MEM, 17 Jan. 2017.